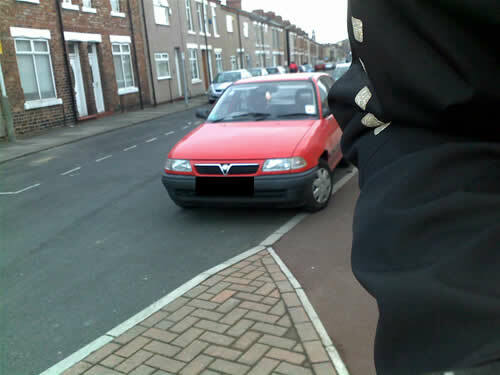 Another regular annoyance on my ride to work, is the red Astra that parks over the bike path exit on Borough Road. This short length of bike path allows cyclists to legally bypass the No Entry on the northern end on Borough Road, and forms part of one of the main radial routes into town, as well as being on the Sustrans NCN14 route. When heading into town, cyclists using the bike path alongside Haughton Road have to cross the entrance to Bannatyne’s gym and then use the filter to get onto Borough Road. As shown in the Google Streetview below*. This isn’t the easiest manoeuvre and is made harder by the fact there are also often pedestrians crossing in the same place, so cyclists have to watch where they’re going while looking behind themselves back up Haughton Road for gym members turning left, forwards on Haughton Road for people turning right and into the gym car park for people heading for Haughton Road. Add in people sometimes driving out of Borough Road, or the access the the Bannatyne’s HQ, which is also behind you, but on the left and behind a wall and you’ve got a situation that’s not made easier by the parked car! I’ve reported the car to the police via email, with the above photo (but with visible car reg plate) attached, so look forward to their response. Simple thing: Cyclists need priority at this and all other junctions. Then legally you do not have to look for drivers how want to turn in or out.